Tuning – What Is It? Most often, when we talk about a piano being properly tuned we are referring to equal temperament. This is an arrangement for the 12 notes of an octave being equally spaced. Mathematically speaking, an octave is a 1:2 ratio, so in order to divide the octave into 12 equal parts we need a number which when multiplied by itself 12 times is 2. Through using this ratio, one can find all the frequencies based on a set pitch. These are the numbers I’m setting your piano to while tuning. Those numbers are easy to me. For this article they are absolute. When I’m tuning, the challenge is balancing tension. Unisons are an apparent way to reveal this challenge. When tuned, the average tension on a piano string is around 165lbs. There are about 220 strings on a piano. That’s over 18 tons of tension on the entire instrument! To make a string sound an octave higher would require doubling the tension and we can use the same formula for dividing the temperament. If the piano is consistently a semitone flat (A sounds as Ab) the technician is adding 9.26lbs of tension to reach string. Multiply that by the number of strings = over a ton. This isn’t uncommon enough, 3% of my appointments are this much of an adjustment. Last week I raised the pitch of a piano 3 semitones, a minor third. That’s 26.25 lbs per string, over 5,775lbs on the entire instrument! The tension is only about 0.85lbs low. The total tension change on the entirety of the piano might be a maximum of 187. I say maximum because properly maintained pianos often hold their tuning in the bass and upper treble relatively well. Taking this a step further to the minimum threshold we perceive a deviation in the tuning, 0.5¢. Within a unison, even an untrained ear can perceive this with active listening. Now we’re dividing the octave into 12,000 parts to measure tenths. 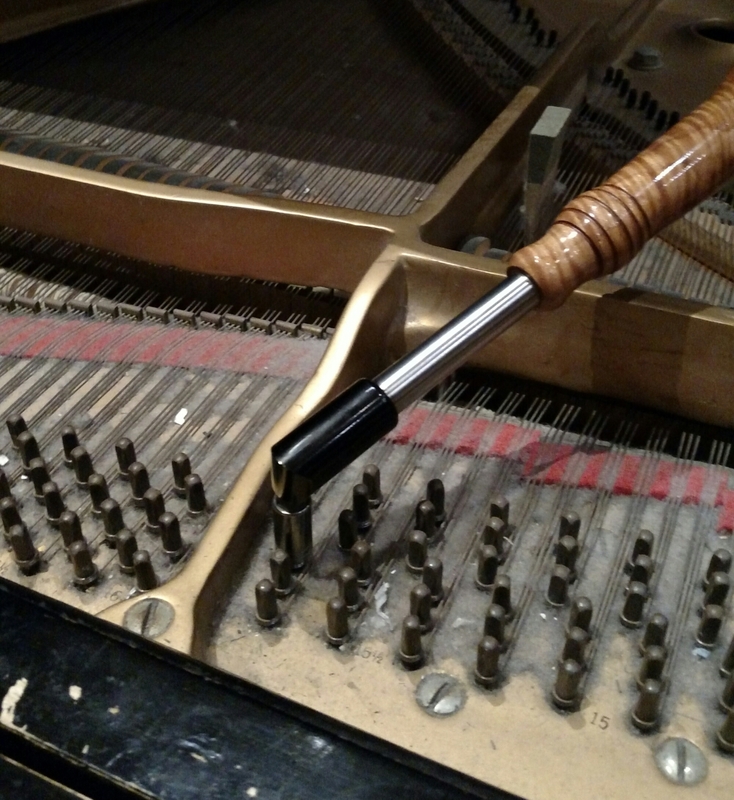 As a piano tuner I am constantly listening to create a unison within less than 0.05lbs. Yes, I can hear that within the course of playing, especially in an otherwise perfectly tuned chord.